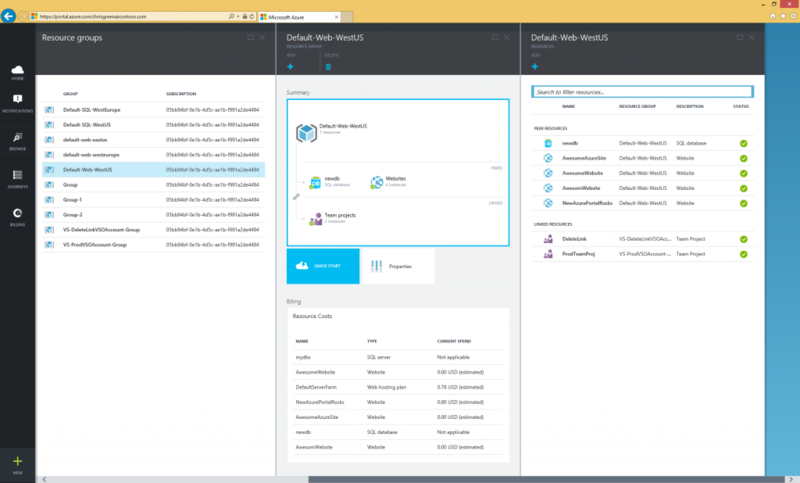 Resource groups are a new concept in the Azure Preview portal. We think of them as "lifecycle boundaries," because when resources share a resource group, their lifecycles (from create, to update, to delete) are managed in an integrated way. Use resource groups to collect and manage all your application resources. Link resources across resource groups, share resources across lifecycle boundaries, and manage costs. View, monitor, and track your usage and billing for all the resources your application uses. New visuals show you every resource in the group, including any resources that are linked across groups. Learn more about using Resource groups in the Preview portal.